How to implement Google map in ASP.NET ? 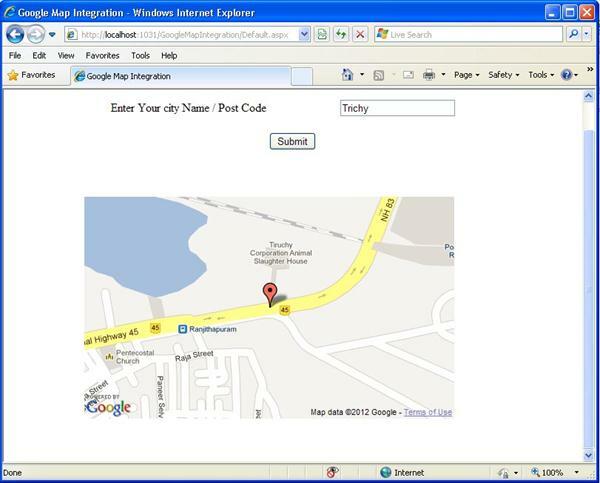 In this article I have explained about how to implement Google map in ASP.NET application. In our website contact us page or other pages we like place Google map. This article help you learn how implement in your projects. Learn how to implement Google map in ASP.NET? In this article I have placed one textbox control to collect city name from user, based on the city name display location in the Google map. 1) Before that integration you need to create Google API key for your project. Click here to generate Google Map API Key after sign up and enter your website URL. API Key is look like "ABQIAAAA_mr7zRpGJ0vX6udAWFxOoxQv0BUlvCZ9OZNoOeNQxd1yxVj1aRTTTz1FO57BxsmvS_aMQ59Hv2fQ4g"
2) Add GMaps.dll as reference of your project. After create API Key placed in web.config file. &LT;cc1:GMap ID="GMap1" runat="server" enableHookMouseWheelToZoom="True" enableRotation="True"
enableHookMouseWheelToZoom: It is used to Zoom your map level based on the mouse scroll. enableRotation: This property is used to show rotation of your google map. Here with I have attached source code download it and try to learn about Google map integration in ASP.NET. I hope this article is help you to learn about Google map integration in ASP.NET. I am glad to be a visitant of this utter blog ! , regards for this rare info ! .